WHEELIE VIBRANT: Tony Redmond''s piece will feature among a colourful array of art at this year''s Festival of Glass. Art sleuths are descending on a record 33 north Bellarine businesses in the 2019 Festival of Glass’s annual treasure hunt. 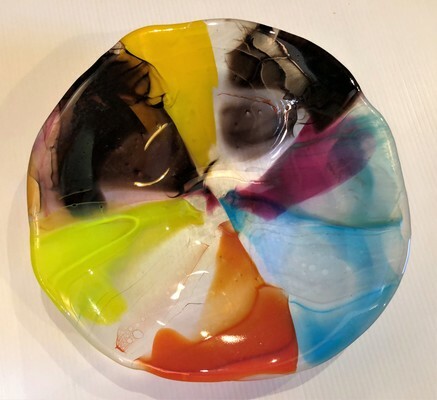 Each business is displaying a piece of local glass art, which are prizes in a draw at the Festival of Glass Expo on Sunday 17 February at Drysdale’s Christian College. Businesses are also displaying a glass ‘tiny treasure’ and when a treasure hunter finds it, the business stamps their entry form. Each entry form with 10 stamps can enter the treasure hunt draw. “Everyone wins in our treasure hunt,” organiser Diane Schofield said. The treasure hunt kicked off earlier this month with 45 guests enjoying a high tea at Cafe Zoo in Drysdale, while watching local glass artist Glenda MacNaughton blowing and sculpting glass. “Everywhere I looked, people were tucking into the yummy food, watching Glenda blowing glass or talking about what she was doing,” Schofield said. The hunt has more than a hundred pieces of locally-made glass art as prizes and involves businesses in Curlewis, Drysdale, Clifton Springs and Portarlington. Its annual expo features 40 artists, the Glass Art Awards and glass art demonstrations.